I simply plan ahead. Especially on days when we go to the coast, sometimes we’ll go out to dinner, but we usually just want to sit on the porch and take in the view. I put some some frozen chicken tenders, already marinated in buttermilk, in the travel cooler and when we arrive, they will be ready to sprinkle with a rub I got at Williams Sonoma for fajitas. I bought avocados several days ago so they will be ready to mash for fresh guacamole. I bought some queso at Costco, Hungry Husband is going to grill the chicken tenders and with some tortillas and a quick saute of some fresh veggies we will be ready to feast! This is a great way to serve guests too, everybody creates their own. 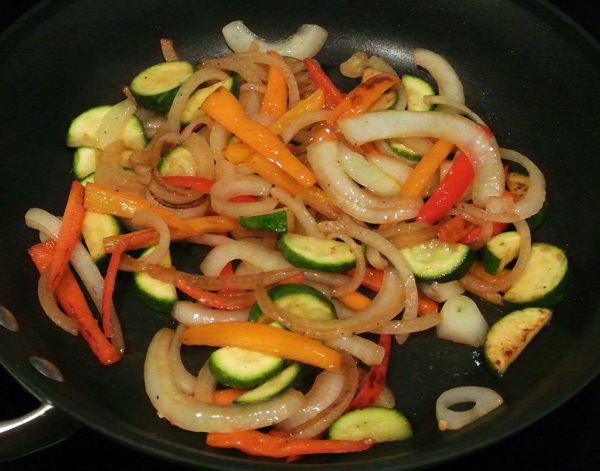 Veggies are ready. When HH finishes grilling the chicken we just pile everything on a tortilla and roll up. 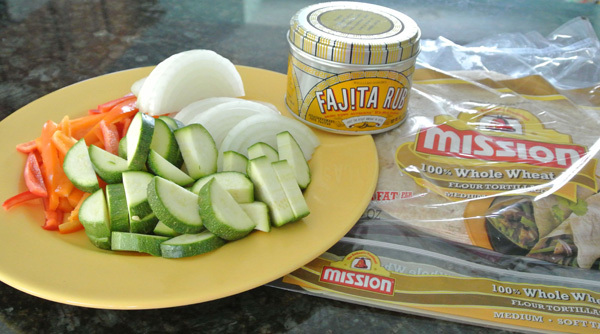 Grate some cheese or heat up some queso to top your fajitas and don’t forget the sour cream and salsa. 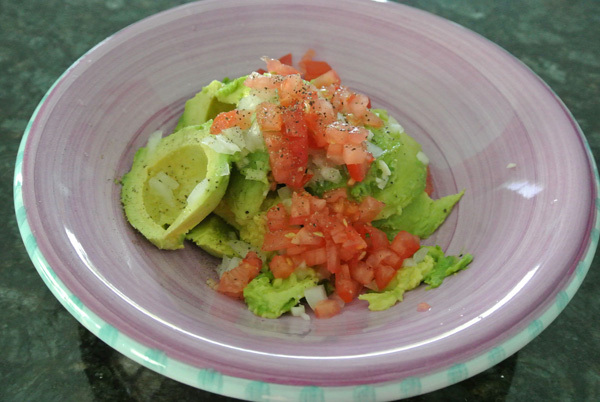 I think fresh guacamole makes the whole deal super special and its easy! Guacamole reminds me of growing up in Californina. My parents lived outside of San Diego in Pauma Valley which was covered in citrus and avocado groves. The bounty from these groves was everywhere, friends often arrived with baskets of freshly picked fruit. We had fresh squeezed orange juice every morning and avocados with everything. At cocktail time there was always fresh guacamole to nibble on. Simple is the best way to go here. Fresh California avocados, a little lime juice, and S& P. Sometimes I add a little chopped onion and tomato, cilantro, garlic and dash of hot sauce. Cut avocados in 1/2 and insert knife blade firmly across pit as if to slice it. Give it a twist and the pit will pop right out on the knife blade. Then using a spoon simply scoop the avocado out of the skin. If it is ripe it will come right out. Toss it in a bowl with a little chopped onion, fresh tomato, well drained, a little S & P, a little lime juice and a clove of minced garlic. Add some hot sauce if you want it spicy. I don’t like to mash too much, I like guacamole sort of chunky, but you are the designer here, go with what makes you happy. 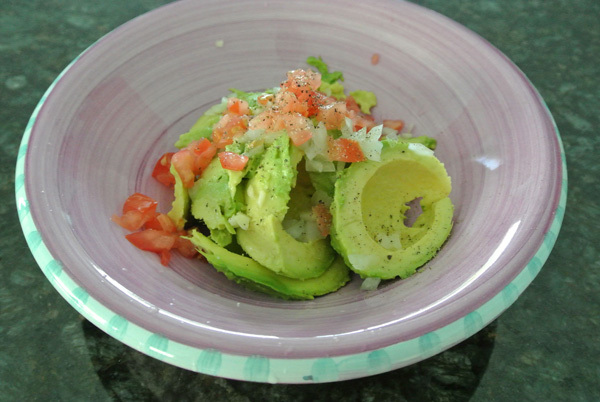 My mom insisted that putting the avocado pit in the guacamole kept it from browning, so I always do that in her honor. You can remove it before serving if you like, but it shows guests that they are getting the real deal! See the slice in the pit where I used my knife to remove it? Slice avocados in 1/2. Remove pit by imbedding knife blade in it, give it a twist and it should pop right out. Save one pit to use to keep guac from turning brown. 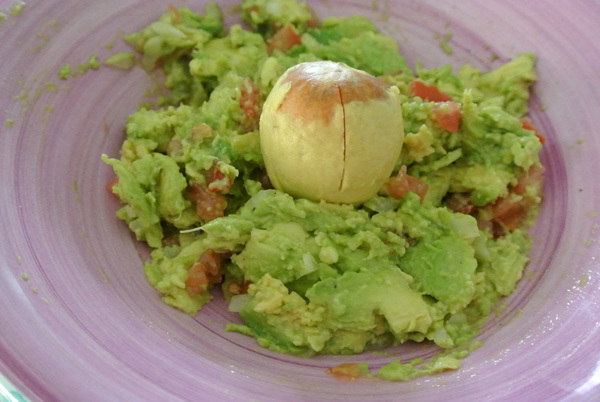 Scoop out avocado meat with a spoon, it should come neatly away from the shell if the avocado is perfectly ripe. 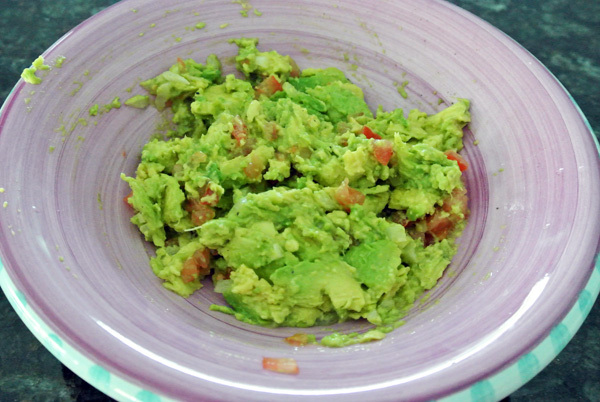 Put avocado in a bowl and gently mash with fork. I like mine a little chunky so I use a light touch here, and incorporate the rest of ingredients.